Were the Freemason's Guilty ? And you don't tell the.. secrets of the Freemasons.. 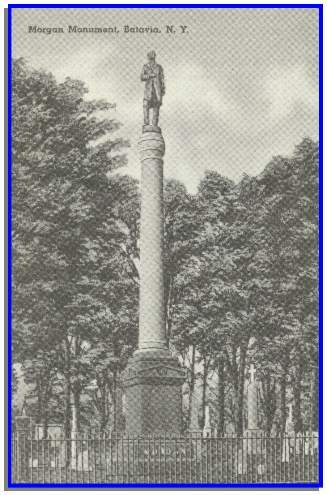 The National Christian Association (an Anti-Masonic group) erected the above monument to William Morgan in the Batavia Cemetery in 1882. Genesee County residents were shaken by an episode in 1826 that had nation-wide repercussions. This was the disappearance of William Morgan. William Morgan was a native of Virginia and a stone mason by trade. In 1821 he moved to Canada and went into the brewing business. When his brewery burned, he moved to Rochester and resumed his trade of mason. Later he moved to Batavia and was a member of the LeRoy Masonic Lodge. The members petitioned for a charter in Batavia and Morgan was one of the signers. If Batavia received the charter Morgan would be a member with the other signers. The people of Batavia did not want him a member because of his notorius character and accordingly destroyed the petition which he had signed and another was drawn up and signed in his absence. When Batavia received the charter and he learned he was not a member, he was very angry and determined to disclose the unwritten secrets of the fraternity. Having been expelled from the LeRoy Lodge in 1826, he wrote a book. In so doing he awakened the hostility of the Masons. In September he was arrested for stealing a shirt and cravat in Canandaigua and brought before a justice Batavia. However, he wished to be taken to Canandaigua so that he might prove his innocence. The he proved and was released but he was immediately arrested for a $2.00 tavern bill. He was lodged in the Ontario County jail. In the absence of the jailor several men (supposedly Masons) came and advised the jailor's wife to release Morgan as the judgement had been paid. The prisoner was liberated only to be seized and thrust into a carriage upon reaching the street. He was driven west through Rochester and passing through LeRoy, the carriage stopped at Ganson's Tavern and also at a tavern on West Main Street. Then he was driven west to where his wife and children lived. This was the last he was ever seen. It is supposed that he was taken to Fort Niagara and drowned in either Lake Ontario or the Niagara River. Because of the abduction of Morgan a wave of indignation against the Masons spread through New York and adjoining states. Anti-Masonic societies were formed and finally resolved themselves into a political party and entered the arena of national politics for the election of 1832. Because of the influence of the Anti-Masonic Party, DeWitt Clinton, Governor of New York, an able and valuable statesman, was not elected. The party soon submerged into the Whig party and would scarcely be remembered but for the fact that it introduced into national politics three statesmen of great renown; William H. Seward, Thurlow Weed and Thadeus Stevens and the more important fact that it instituted the national nominating convention, an example soon followed and still followed by all other parties.